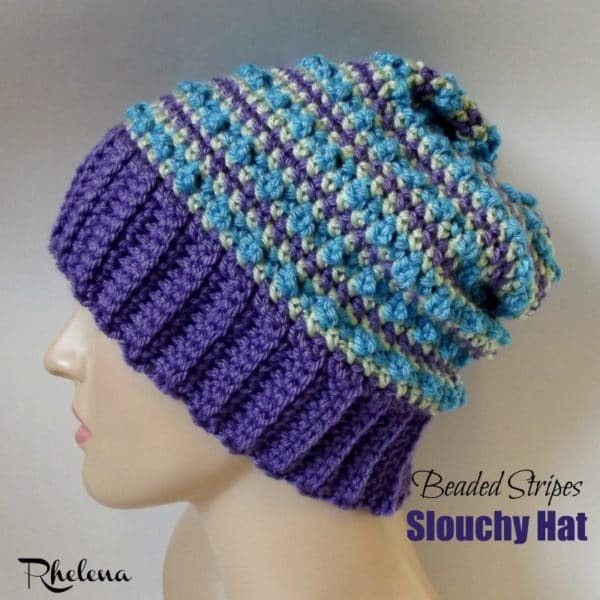 Free crochet pattern for a slouchy hat. This hat pattern is given in one size. However, you can crochet this to any size by increasing the ribbing rows in multiples of two. It’s the perfect match to the beaded stripes earwarmer. If you’d like to crochet a cowl to match, simply follow the instructions for the ear warmer, but start off with at least around 80 chains. For a double wrap around the neck I would start with at 150 or more. Gauge: 2″ over 7 sts. Finished Size: 9″ across by 9″ high. Bead St: Insert hk into indicated st, yo and pull through, (yo and pull through one lp on hk) twice, yo and pull through both lps on hk. When you work into the next stitch make sure the bobble is facing the right side. See Tutorial. Note: Carry yarn up at each round to avoid unnecessary loose ends. Rows 2-60: Ch 1, blsc in each st across. Turn. (9 sts) Continue with this row until you have reached a desired circumference making sure to end in an even number of rows. Ch 1 and join the ribbing rows by slip stitching the last row to the free loops of starting chs. You might have your own way of doing it, but I like to join the front lps of last row worked to the free loops of starting chs. Rnd 4: With CB, Ch 1, sc in same st as join and in each st around; With CA, join with sl st to first sc. Rnd 5: With CA, Ch 1, sc in same st as join and in each st around; With CB, join with sl st to first sc. Rnds 6-27: Rep rnds 2-5 ending with rnd 3 at rnd 27. Rnd 29: With CA, Ch 1, sc2tog around; join with sl st in first sc2tog. (15 sts) Fasten Off leaving a 8-10″ tail for closing of hat. Weave the tail end through last rnd. Pull tight and secure. Thank you Sandra Jones Haynes for testing this pattern.